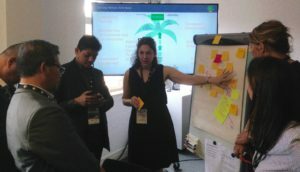 Caren, working in partnership with Aimee Russillo and with the support of Accreditation Services International (ASI), designed and delivered the Roundtable on Sustainable Palm Oil (RSPO) Theory of Change. The team worked closely with the RSPO secretariat and executed a process that included extensive stakeholder participation and engagement with the Board of Governors. The team also delivered the foundations of an M&E system to support the new Theory of Change. To view the Theory of Change, supporting documents and a video, click here.